With its sleek black finish, chrome corners and angled legs the Buffalo Outrage is a real statement table, and would look fantastic in any modern home games room or communal area. Perfect for people of all abilities from the novice player to the professional. As a 7ft table the Outrage is a sleek model that will fit into a wide variety of home and communal environments. The Buffalo Outrage has been assembled using high quality components including a three-piece 1" slate, American style drop pockets, metal corner skirts and middle pocket metal plates. A stylish table that even includes leg levellers in order to enable the perfect playing surface. One Spots & Stripes pool ball set. The Buffalo Outrage II can be fitted with an American Atlas speed cloth available in: Green, Black, Blue, Purple, Burgundy and red. Atlas cloth is an American speed cloth, designed to increase ball speed and accuracy during game play. It is important when choosing your table to consider the site or room you wish to place it in. It is recommended that there is enough room to fully extend the pool cue from the edge of the table to the wall. 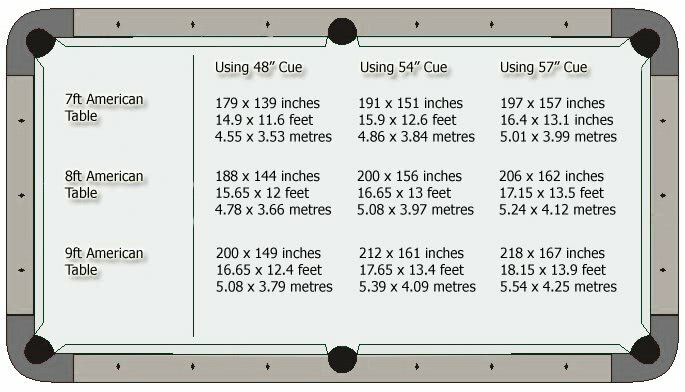 The dimensions below are an ideal size, however if space is tight why not purchase a short cue to help with any tricky shots!